The Ultrasonic Transducer Kit (UTK) has been developed to teach the principles and applications of low power ultrasound transducers. 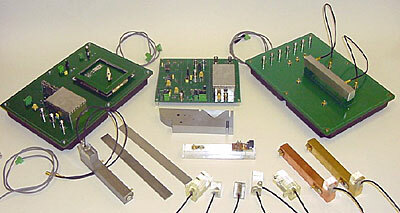 The UTK contains a number of different types of ultrasound transducers, hardware that can be interfaced to these transducers, and a variety of test pieces. The courseware introduces the principles behind the main topics of interest, which are supported by assignment work using hardware from the kit. The courseware and assignments are supported by MATLAB® programs. Applications in inspection, sensing systems & industrial monitoring. The first addresses transducers and the physical principles behind their application and operation. The second addresses some of the applications of ultrasound and ultrasound transducers. Main board: contains the amplifiers and drivers for the other components of the kit. Basic transducers: one contact transducer with a delay line, two variable angle transducers, two fixed angle wedges (70º & 35º and 55º). Test pieces: steel and aluminium test pieces with fixed angle transducers attached, perspex test piece with fixed angle and PVDF transducers; optional copper and brass test pieces with fixed angle transducers attached. Test board: for mounting the test pieces during experiments. Test block: for transducer calibration and to demonstrate various applications of ultrasonic inspection. Vibration and SAW oscillator board: with the hardware required for experiments: the use of acoustic emissions in machine monitoring and temperature measurement using SAW crystals. Documentation and software: The kit is completed with a CD providing the documentation as PDF files and a number of MATLAB® programs to support the material. Main board; test board; documentation; multimedia pack (for PC); contact transducer; dual angle transducer; delay line; steel, aluminium and perspex test pieces; test block. Basic kit plus: vibration and SAW oscillator board; two variable angle transducers; 50° transducer; brass and copper test pieces; steel test pieces for plate waves; MATLAB® examples (PC format). Both the above kits may be supplied either with or without a data acquisition system that incorporates an oscilloscope module and a spectrum analyser module.